Our professional storm chasers are expert meteorologists and severe weather forecasters. Brian is one of the most sought out storm chasers in the world and has been the subject of numerous documentary films, such as Our World: Storm Chasers, produced and broadcast by the BBC throughout Europe. He has also worked on numerous television and film projects such as Gethin Jones’ Danger Hunters (Virgin Media), Tornado Chasers (National Geographic Television) and much more. 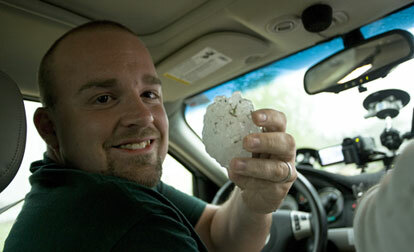 Brian grew up in Oklahoma where he was constantly exposed to severe weather that fascinated him. On April 24rd, 1993 an F4 tornado near Catoosa, Oklahoma destroyed his car a few hours before his high school prom, nearly killing him in the process. At that moment, he knew that chasing tornadoes was in going to be his future. Brian has witnessed the most intense tornadoes on the planet including the May 3rd, 1999 Oklahoma City tornado, the May 4th, 2007 Greensburg, KS tornado and hundreds of others. Brian enjoys teaching our clients not only about storm chasing, but photography as well. He dedicates most of his photography work towards various conservation and wildlife issues. He is photographer on the board of advisors at Ric O’Barry’s Dolphin Project and has traveled around the globe to expose such issues as the inhumane slaughter of dolphins throughout Japan. While working in Japan during March of 2011, Brian was in Otsuchi, Iwate Prefecture along the coast less than 30 miles from the epicenter of the megathrust 9.0 earthquake, the 4th largest in world history and experienced the tsunami which destroyed the entire coastline around him. He survived the tsunami by seeking vertical shelter on a hill that overlooked the ocean, watching Otsuchi (the hardest hit town) and everything around it get swept to sea as the tsunami receded. Brian credits his formal training in emergency management and his long history of dealing with natural disasters as the reason he was able to survive the Japanese tsunami, he’s the only person on the planet and that can truly say he’s experienced all of nature’s worst types of disasters including a mega-earthquake, super tsunamis, category 5 hurricanes and EF5 tornadoes! Brian is a USCG Licensed Master Captain with endorsements in Commercial Assistance Towing and Auxiliary Sail and spends most of the year in the tropics operating charter vessels and teaching scuba to recreational and technical divers. He is also an avid ham radio operator and holds a General Class amateur radio license with the callsign of “WX0USA”. Tony Laubach is an professional storm chaser who has been logging miles across the country in search of spinning clouds since his first tornado intercept in 1997. Tony currently holds a bachelor’s degree in meteorology and is working towards his masters degree. He and his work have been featured for three seasons on the Discovery Channel hit TV series “Storm Chasers” with the TWISTEX research team lead by the late Tim Samaras. He has also been featured on specials for National Geographic, Women’s Entertainment, BBC, and ABC News. Tony is a very successful freelance photojournalist and his work has been regularly featured on news networks worldwide since 2002. Tony is known among the chaser community for wearing the number of Washington Redskins Hall of Fame wide receiver, Art Monk, in his ventures across the Plains. Tony holds a Technician Class amateur radio license with the callsign KW0LFF, a call sign that he created based on his favorite animals, the wolf. 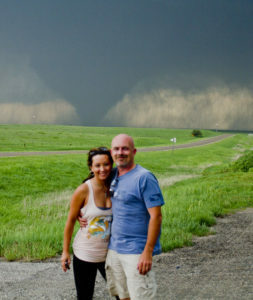 Tam married Brian in 2013 (we know, we can’t believe it either) and has witnessed more than 150 tornadoes while participating on the tours as a tour guide. 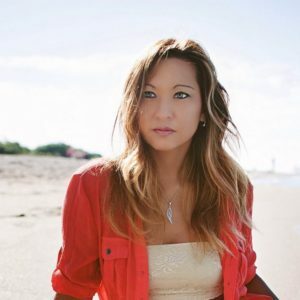 Tam is a registered nurse who originally hails from Calgary, AB, Canada and is licensed to practice in Canada, as well as several U.S. states. An avid photographer, Tam has taken over as primary photographer while on tour so that Brian can focus more on interception strategies and overall safety. In her spare time, Tam volunteers for various organizations such as Shark Fin Free Calgary, a campaign to ban shark’s fin from restaurant menus in Calgary and Wolf Matters, a campaign working to protect Canada’s wild wolf population from hunting and trapping. She also volunteers countless hours at wildlife rescue organizations in Florida, where she and Brian live during the off season. Tim received his B.S. 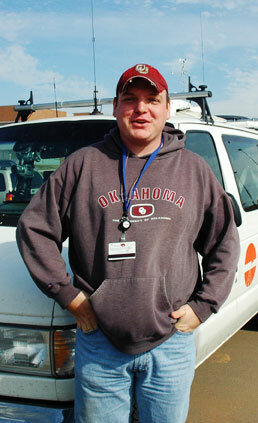 Degree in Meteorology from Oklahoma University and is currently working on a M.S. with a research area in radar meteorology with an emphasis in Wind Turbine Clutter Suppression on the WSR-88D (NEXRAD) Network – Meteorological and Climatological Aspects. Tim worked as a Student Research Assistant for with the National Weather Service’s’ Radar Operations Center (ROC) Applications Branch in Norman, OK where he tested radar algorithms and created software used in weather radars. Tim has also worked with the SMART-R Radar Storm Intercept Team and has completed several deployments during NSSL (National Severe Storms Laboratory)’s TELEX-II project during the 2004 spring storm season. Tim is originally from Kansas City. His family owns a limousine service and he is also a highly qualified professional driver who, at times, participates on the tours as a guide and driver as well. When he is not actively on a tour, he’ll be helping Brian and the team pinpoint the best location throughout Tornado Alley for the best chances of severe storms. Tim is a valuable member of the StormTours.com team and we’re sure you’ll enjoy getting to know him. Paul Harrop is an award-winning photojournalist and storm chaser that has has deep roots on each side of the Red River, which divides Texas and Oklahoma. After graduating from Eisenhower High School and the Kravis Broadcast Institute, Paul began his television career at a production company in Oklahoma City as a project manager. From there, the news bug bit, and he joined KOCO-TV in Oklahoma City where he was a valued member of the First Alert Storm Team (F.A.S.T.) providing life saving information with his live broadcasts from the field while chasing tornadoes. Paul worked as part of a news team that won numerous accolades including a Peabody Award, an Edward R. Murrow Award and an Emmy Award. 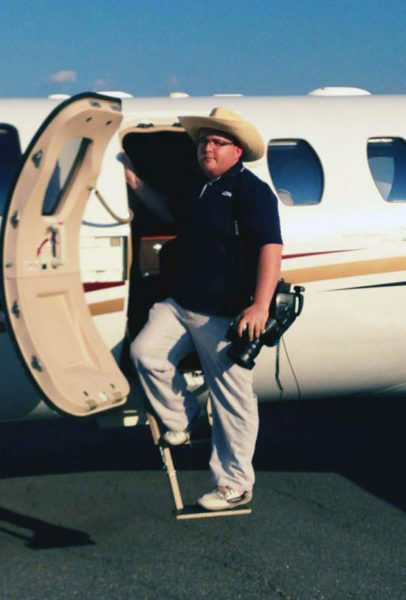 Paul currently works full time as a media producer and television hosts for the Aircraft Owners and Pilots Association (AOPA). Paul holds a General Class amateur radio license with the callsign “WX5USA”. Sarah has always had a strong passion for severe weather and started chasing storms in 2003 when she was working on her degree in Meteorology from The Ohio State University. Sarah spent a semester as an intern with the National Weather Service in Columbus, Ohio. Sarah provides additional forecasting support during our storm chasing tours. 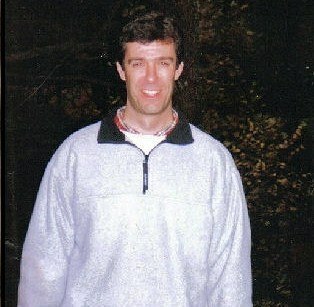 Rick was a close and personal friend of Brian’s for many years. Rick worked as a research scientist for the Polar Meteorology Group at The Ohio State University’s Byrd Polar Research Center where he performed numerical modeling of the meteorological conditions at the onset of the Laurentide Ice Sheet, the last major glaciation that covered most of Canada and the northern U.S. about 20,000 years ago. There is no doubt that his biggest meteorological passion was severe weather. Rick was frequently asked to lecture to meteorology courses at OSU about thunderstorms and tornadoes. Each year he would spend his vacation guiding storm chasing tours in Tornado Alley. Rick loved sharing his passion and knowledge of severe weather with storm chasing tour guest from around the world. In memoriam, we list Rick with a spot on our storm chasing team and we ask you to please support the Rick Toracinta Graduate Scholarship in Atmospheric Science Endowed Fund at The Ohio State University. His scholarship commemorates Rick’s lasting interest in the atmosphere as well as his desire to be a teacher, the funds raised through Rick’s scholarship help future meteorologists with their educational costs.